This piece was originally published on India Together. It would be difficult to identify a more maligned aspect of the public transport experience than the transfer. Particularly with bus services, having to transfer between one bus to the next is perhaps the number one peeve of public transport users. Users attach a very high price of inconvenience to it, more than the initial wait for the bus itself. And bus service providers are very aware of this fact; public transport authorities in cities across India resist transfers, no matter how large the benefits are. But the bad rap that transfers get is very unfortunate for those who want a high quality bus service for their city – government officials, planners, sustainability advocates, and most of all public transport users. Transfer-based bus networks can result in services that provide significantly higher quality and coverage compared to the alternative. It is doubly unfortunate because many complaints that users have regarding transfers can actually be solved by moving to a more intensively transfer-based system itself. But before dealing with the issues of transfers directly, it is important to make the case for why transfer-based bus services should be the preferred option. Broadly speaking, there are two ways in which city bus services can be organised. The first is to offer ‘direct services’. This is where each bus route acts as a direct connection between two given destinations. This is the form of bus service that will be most familiar to Indian bus users. Most city bus services in India operate along this principle, connecting each major destination – residential areas, shopping districts, business parks – directly to another such destination. An alternative system of organisation for city bus services is what is increasingly being called the ‘integrated services’ model. This model goes by many names – ‘trunk and feeder system’ has been used in the past, ‘direction-oriented services’ has also been used more commonly in recent years. But whatever the name, the essential organising principal is the same. A given destination, instead of being directly connected to the city centre by a specific route, is connected to an intermediate transfer point from where the user transfers to another service that continues in the direction of his or her travel. For example, a ‘feeder’ bus service will connect a destination to the nearest major arterial or main road. At this point the user transfers to a ‘trunk’ route that travels on the arterial road only. The trunk route may take the user to the final destination, or the user may make a transfer to another trunk or feeder service. The superiority of the transfer-based integrated services model over direct services boils down to two main aspects: Simplicity and Service Quality. To illustrate how integrated services result in networks that are simpler, consider the following model. Suppose we have three major destinations in the city centre. These could be, for example, the central business district, the main city market, and a transportation hub. Now, consider the route network that would be required to serve a series of neighbourhoods that lie along one major arterial road leading away from the city centre. Let us first suppose that there are 3 residential neighbourhoods, each at a moderate distance away from the arterial itself. In the direct services model, each of these residential neighbourhoods would require a direct bus service to each of the three destinations in the city centre. That is, three routes serve each neighbourhood. The direct services route network therefore comprises of 9 routes. Consider now the case of the integrated system. In this case, each neighbourhood is connected only to the nearest arterial road. That adds up to 3 routes. Three routes, however, serve the arterial road itself, – one to each major destination in the city centre. So by making one transfer, users can still reach any of the three central destinations from their individual neighbourhood. In total then, this system has 6 routes – 3 feeder routes connecting neighbourhoods to the arterial and 3 trunk routes on the arterial. 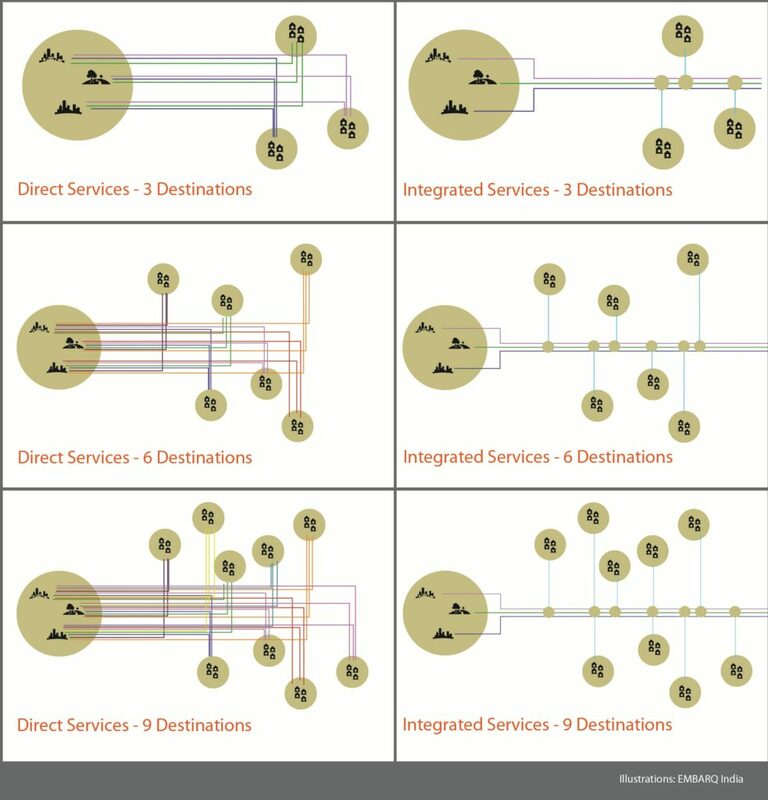 So in this particular case the integrated services model provides the same level of coverage with 3 fewer routes than the direct services model. A difference of 3 routes may not seem like a lot. But this differential rapidly grows as the number of neighbourhoods along the arterial increases. Say the city grows in size, and the arterial road now has 6 neighbourhoods that lie along it. In the direct services model we now have 18 routes – 3 routes from each of 6 neighbourhoods. In the integrated model, by contrast, we only need 9 routes – 6 feeders but still only 3 trunk routes. That’s a difference of 9 routes. If the city expands even further to the point where 50 distinct destinations lie along the arterial, the integrated services model has 53 routes while the direct services model has a whopping 150. The number of routes in the integrated model can also further be reduced if a single feeder route can serve different neighbourhoods across an arterial road. But why is simplicity in a bus service network so desirable? The main reason is that simple systems are easier to use and, more significantly, allow for an expanded choice of travel patterns. Bangalore is a good example of the dizzyingly high number of routes that can result from the direct services model. The Bangalore Metropolitan Transport Commission (BMTC) operates over 2300 routes in the city. From personal experience, even the most ardent public transport advocate will struggle to make sense of such a complex network. By contrast, London, a city with similar numbers of residents, bus ridership numbers and bus fleet size, operates a little over 700 routes – by no means simple, but certainly simpler. Due to the large array of route numbers that result from direct services and the lack of any intuitive or logical way to organise them mentally, users will often stick to a route that they know works for them – even if using other unfamiliar routes will result in more efficient travel. For example, a user may be used to traveling by route 350-A. Route 368-F would also take the user to the exact same destination. But if there is no easy way to figure this out just by seeing the route number or destination name – and memorising the patterns of many different routes is not feasible – the user will continue to wait for the 350-A bus even as several 368-F buses come and go. Finally, transfer-based systems also open the possibility of many new travel patterns that are more difficult to execute in the direct services model. For example, consider a user who wants to travel from one neighbourhood to another that lies on the other side of an arterial road. In the direct services model, such a trip is difficult to plan – the user has to get to the arterial, and then wait for the very specific bus route that will take them to their destination. If the destination isn’t one where routes terminate, they will also have to know the exact routing of the bus they are waiting for. More likely, the user will take a bus till the arterial then hop in a rickshaw, taxi or other mode. In the transfer-based system, however, such trip patterns become easier to execute. The user takes a feeder to the arterial, travels on the trunk service in the direction of their final destination, and then transfers again to another feeder to the final destination. Excessive complexity also raises many barriers to entry for new public transport users. When a system has so many different routes, creating good user information systems such as maps at bus stops or online journey planners is a Herculean task. On a busy arterial road, it would take an enormous amount of display space at the bus stop simply to list all the bus routes serving each stop, and if this were done digitally, it will take several minutes to scroll through the whole lot on a small screen. In the absence of such information, then, a new user would have to rely on the knowledge of fellow bus users, which in itself may or may not be reliable, or undertake a significant number of trial-and-error trips before identifying the solution that best works for them. When we talk about Service Quality, we’re talking mainly of two things: Frequency and Reliability. These are by far the two most important factors that determine whether users are happy with bus services. Integrated systems do better on both counts. One of the weaknesses of the direct services model is that as cities expand rapidly and, therefore, the number of destinations requiring bus services increase, the number of routes increases even faster. And since these new destinations are likely to be farther away, their route lengths also steadily increase. But cities struggling with limited resources – as in India – cannot increase their fleet sizes fast enough to keep up. Over time, a slowly increasing number of buses are spread more and more thinly over a rapidly increasing number of routes. Bangalore again, is a good example of this phenomenon. Although it has a very healthy fleet size of over 6100 buses, these are used to service more than 2300 routes. So what you ultimately end up with is a system that has a large number of routes where only one bus is serving a route length of 35-40km or more. This means that you can only achieve a bus service frequency of 1 bus every 2 or 3 hours. At this low frequency, public transport is not a preferable alternative to private vehicles. In the integrated system, by contrast, route lengths for feeders are usually 4-6 km or so. This means that, even with one bus, you can provide service at a frequency of 15-20 minutes. And on arterial roads, high frequency trunk services can arrive in as little as 1 or 2 minutes. Integrated services can thus provide higher frequencies on feeder routes, and the difference is very significant for destinations that are far away from the city centre. On the arterial roads, however, direct services actually provide higher frequencies as you get close to the city centre, as more routes, and therefore buses, join the trunk road. But this is not a positive. In many cases there is actually an oversupply of buses in the city centre. And having more buses than necessary entering the city core may actually make congestion worse. In other words, direct services result in a grossly unbalanced service pattern that offers significantly higher frequencies in the city centre compared to the periphery, a pattern that is often at odds with the real travel demands of users. Integrated services, on the other hand, provide the same frequency throughout the length of any given ‘link’, be it the trunk or the feeder. Moreover, if the frequency on a given link is found to be higher or lower than required, removing or adding a bus can easily remedy it. Thus optimizing integrated bus services to meet actual demand is also much easier. The modular nature of integrated services also has a major positive effect on reliability, that other most cherished desire of public transport users. This effect is particularly noticeable on the arterial road. In direct services, the arrival of the ‘next bus’ at any given bus stop is highly unpredictable. This is because of the large number of routes and the large spread of their route lengths. The same stop may serve some buses that have a route 10km long, some that are 15, some 20, some 35, and any length in between. This means that the next bus may arrive 2 minutes from now, 6 minutes from, or 25 minutes from now. In the integrated services model, however, there will not only be a significantly reduced number of routes but most of these will also be of similar lengths. Thus the variation in the time till next bus arrival will be far lower and much more predictable, leading to a more reliable service. Thus Integrated, transfer-based services are simpler to use, can provide more appropriate frequencies and can be more reliable than direct services – ultimately resulting in a bus service that is more convenient to use. With that, now let’s get back to the issue of transfers themselves. Are transfers really so painful and inconvenient as to negate all the advantages that can be captured in a transfer-based system? There are several reasons to suggest that the general perception about the inconvenience of transfers is overblown. First, let us look at why people dislike making transfers. The main complaint about transfers is that waiting time for the following bus is very high. This, ironically, is a by-product of the direct services model itself (due to its tendency to result in low frequencies on individual routes). When frequencies on connecting services are high and waiting times low, much of the reluctance to transfer disappears. A second major reason is that the physical experience of making a transfer is often uncomfortable. Having to wait at ill-designed bus stops, often while being exposed to the elements and not having a place to sit, justifiably results in negative associations with the act of transferring. The key lesson here is that any animosity towards transferring is due to the inconvenience of the process itself rather than due to any inherent dislike of the concept. Providing comfortable, all-weather bus stops with a few basic amenities puts another large dent in the reluctance to transfer. A useful analogy to draw here is with metro systems. The use of transfers on metro systems is much more prevalent and the people who make them complain much less – or at least their complaints are much fainter. This is largely because metro stations are enclosed and comfortable and users know their next train is going to come pretty soon. A second reason to doubt predictions of mass user resistance if a transfer-based system is introduced is that most people using city bus services make transfers anyway. It’s just that these transfers are from other modes. In other words, many people reach the bus stop by rickshaw, or are dropped off by two-wheelers or other private vehicles and then transfer to the bus. 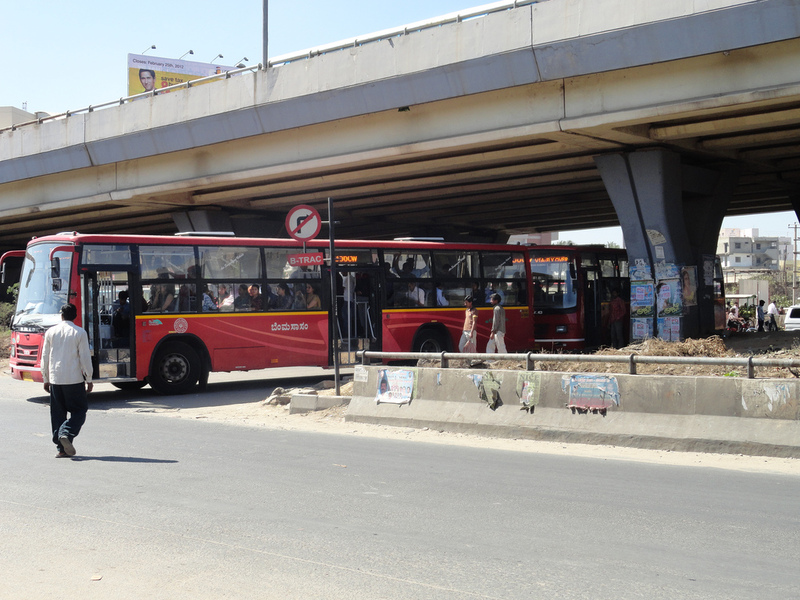 A recent survey conducted by EMBARQ India at several bus stops along a major arterial road in Bangalore found that the majority of people accessed the bus stop through motorized modes other the bus, even when they came from areas that have a bus service. The poor frequency of the first bus meant they had to find other means to reach the bus stop. So what’s the catch? There are a few. But these are by no means deal breakers. The first is that to make a transfer-based system work, you need to develop a large network of well-designed bus stops. This in turn, will require a certain sum of money. But this amount would certainly be very modest compared to other investments like flyovers or underpasses. Second, making transfer based systems truly convenient also requires seamless ticketing. This is a technology fix, and smart card-based solutions, though undoubtedly tricky, have been tried and tested the world over. Cleverly designed ‘analog’ systems can also work. Fares will also need to be reformed to encourage transfers, but as long as the new system remains at least cost neutral to the user this should not be an insurmountable problem. User education is another challenge. Changing long-established patterns of how things work is bound to generate some resistance, especially in something that plays as large a role in people’s lives as public transport. But experiences from several cities around the world – Bogota, Sao Paulo, Seoul, to name just a few – show that such large-scale changes are not only possible but that the pain is temporary and quickly replaced with praise if the new systems works better. In summary, while transitioning to integrated transfer-based bus services is not without costs, these are relatively minor and are far outweighed by the benefits. Ultimately every city is different and the best network design for a given city will be highly contextual. Smaller cities may very well find that the direct services model is perfect for their needs. But as cities grow bigger, the benefits that accrue to transfer-based systems grow more significant. And, of course, every well-designed and comprehensive bus service network will always be a hybrid of trunk-and-feeder routes and high-demand direct services. But if cities, especially the bigger ones, want a truly high quality bus-based public transport network that provides convenient services and wide coverage then they will have to make integrated services the foundation of their system. And to do that we will all need to embrace the transfer.